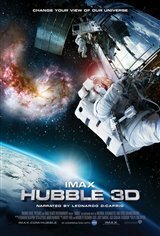 Considering that I have no interest in the space program I was amazed at how interesting I found this movie. An amazing film that really shows how tiny we are in perspective to the universe that God created. WOW. This was so well done. Amazing. This is one of the best IMAX movies I've ever seen. Leonardo Di Caprio is a wonderful narrator and the photography is unbelievable. Enthralling, engaging and entertaining !! You learn so much about space and the space program in this movie. The statistics are staggering. How could we possibly think we're alone in the universe. We have all seen photos taken in space, but these are phenomenal. Shots from the Hubble clearly show earth as well as super novas and stars far beyond the sight of the human eye. The narration, by Leonardo Decaprio, is very informative and you don't have to be a rocket scientist to understand. In IMAX, the visuals are outstanding, highly recommended. This was truly amazing. Gives you a real good look of what it's like in space and the pictures are amazing... like you're right there with them. Can't beat this for awesome!!!! If you are into space movies then it is well worth going too. Wonderful movie and great for all family members. went with my son's school for the end of the year trip to the Ontario Science Centre in TO. Very interesting for all who went! Very educational, it opens up my eyes. Spectacular visuals and engrossing story. Goes to show how Hubble has expanded the human psyche. Great film for the whole family. Love IMAX. Feels like you are right there.